With glaciers crawling down from massive limestone peaks and pristine lakes that range from see-the-bottom clear to so-turquoise-it-looks-fake, the Canadian Rockies has some of the most magnificent landscapes in the world. And if the soaring mountains aren’t enough for you, the four national parks encompassing the Banff / Jasper region boast some of the densest wildlife populations in the world. Here are nine things you can only see in the Canadian Rockies. Even if you haven’t heard of Lake Louise, you’ve probably seen it. 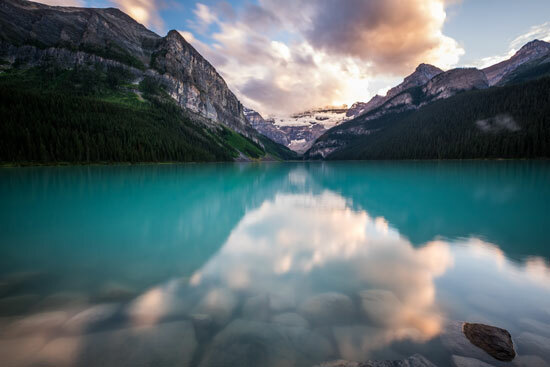 The vibrant turquoise waters of Alberta’s most famous lake have graced thousands of calendars over the years. The other-worldly color is caused by sunlight hitting the silt from glaciers grinding down the surrounding peaks. Explore Lake Louise by paddling out onto in a rented canoe, or hike up to the Plain of Six Glaciers Tea House on a ridge high above the lake for some traditional High Tea with a view. The geologic forces that shape every landscape—rock, water, and time—are fully on display in Marble Canyon. Over the millennia, the glacier-fed Vermillion River has cut a narrow gorge hundreds of feet deep into the limestone, exposing eons of geologic time. At several points, the walls of the canyon are so close together that it looks like you could reach across and touch the other side, and the churning water rushes so far below that you can only hear it. If the beauty of Lake Louise has a rival it’s Moraine Lake. Not only is it tucked deep into the craw of the picturesque Valley of the Ten Peaks, but it’s been confused with Lake Louise more than once (famously on Apple’s Macintosh screensaver). Get here early as the authorities close the parking lot when it fills (usually before 9am in the summer.) Stick around, however, since the true magnificence of its green color doesn’t come out until late in the morning when the sun shines directly into the water, illuminating the suspended glacial sediment. Luckily there are multiple trails leaving from the lake, offering a full day of options to explore. Climb from Moraine Lake up toward Sentinel Pass and you’ll pass through the magical Larch Valley. For most of the year, Larch Valley appears to be like any other pine-forested, glacially-carved cirque. For a few weeks in the fall, however, the larch trees turn bright yellow and begin to lose their needles. The brilliant yellow contrasts with the nearby spruce and douglas fir trees creating one of the most beautiful displays in nature. And that’s even before you get to the high point of Sentinel Pass where you can look down into two glacially-carved valleys surrounded by snow-covered summits and free-standing stone pillars. Like many remote corners in the world, the Canadian Rockies is a place where wildlife flourishes. Elusive animals like moose, elk, and bear are frequently spotted throughout the region, as well as far more common creatures like Canada’s national bird, the whiskey jack. In fact, the whiskey jack, also known as the Canada jay, can often be seen fluttering along the trail pestering hikers for hand-outs. While the whiskey jack may appear tame, they will definitely rob you blind given half the chance. Don’t give them that chance. Like all other wildlife, admire them from a distance. While the castle-like Banff Springs Hotel gets a lot of historical credit for putting the mountain town of Banff on the map, it was the Cave and Basin Historical Site that lured railroad workers into building a cabin, and opening it up for business. William McCardell and Frank McCabe used a felled tree to make their first descent into the cave in 1883. Over a century later, there’s an entranced carved out of the rock leading to the underground waterfall and brilliant blue pool. Unfortunately, soaking in the hot springs is no longer allowed, but the otherworldly rock formations will inspire your sense of wonder. The Bow River is one of Canada’s most iconic rivers, flowing from the heart of the Canadian Rockies across the high prairie to spill into the Hudson Bay. The whole journey begins at Bow Glacier perched on a mountainside above Bow Lake. While most of the lakes in the Canadian Rockies look so turquoise as to be almost opaque, Bow lake’s water is a crystal clear—so clear, in fact, that you can see fish swimming along the rocky bottom. The famed Ice Fields Parkway winds its way from Lake Louise to Jasper through Banff and Jasper National Parks. Over fifty glaciers are visible from the road including the easily-accessible Athabasca Glacier. Walk right up to the edge of the ice, or better yet, go out on the ice with a guide for the incredibly rare experience of seeing a glacier’s geology and hydrology in action. Meltwater rushes down the receding glacier in rivulets that weave back an forth like a bobsled track. Sometimes, the rushing water cascades into giant sinkholes hundreds of feet deep, forming massive under-ice rivers and lakes. Climate change visible beneath your feet. If you just can’t get enough of lakes that look like gemstones, Peyto Lake needs to be on your list. The lake is such a vibrant turquoise that your friends won’t believe your pictures weren’t photoshopped within an inch of their lives. While any view of the lake will be mind-blowing, a little time exploring the area will also lead to postcard-perfect vistas of both Peyto Glacier and the mountain peaks sawtoothing into the distance. Unlike the more populous Lake Louise and Moraine Lakes, getting a little bit off the beaten path at Peyto Lake will give you some quality alone time to drink in the wonders of the Canadian wilderness in true solitude. And that is the ultimate Canadian Rockies experience.